Forest Hill is going back to its roots next month, to be transformed into an urban orchard. Forty-seven shops and businesses in Forest Hill and Honor Oak Park will join forces to create an avenue of 70 fruit trees � the Edible High Road � celebrating Forest Hill�s history and its current standing as a hub of community gardening. A trail map will lead visitors along the route lined with apple, cherry, pear and plum trees, ending in the Horniman Museum�s Gardens at the crest of the hill. Children taking part can also win gardening prizes. 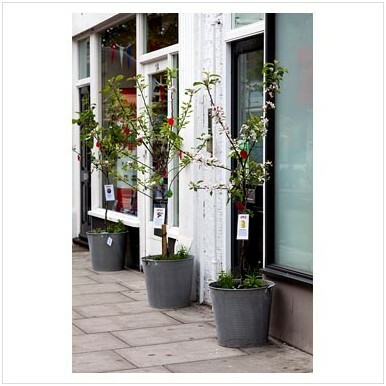 Organised by the Forest Hill Society, in partnership with Lewisham Gardens and Shannon�s Garden Centre, the Edible High Road opens on Saturday 18 May until Sunday 9 June, as part of the Chelsea Fringe Festival, the volunteer-run celebration of plants, gardens and landscapes. The Forest Hill event is part of a city-wide network of Edible High Roads including Shepherd�s Bush, Kilburn, Chiswick and Kensal Rise. The Horniman Museum and Gardens is also hosting a series of other Chelsea Fringe events including a family fun day and plant sale, compost cookery, guerrilla gardening and much more. 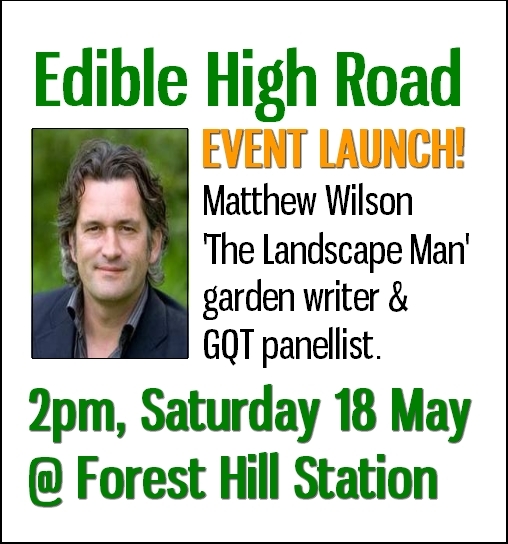 The Edible High Road will be launched by celebrity gardener Matthew Wilson � Channel 4�s �Landscape Man� � at 2pm on Saturday 18 May at Forest Hill Station. 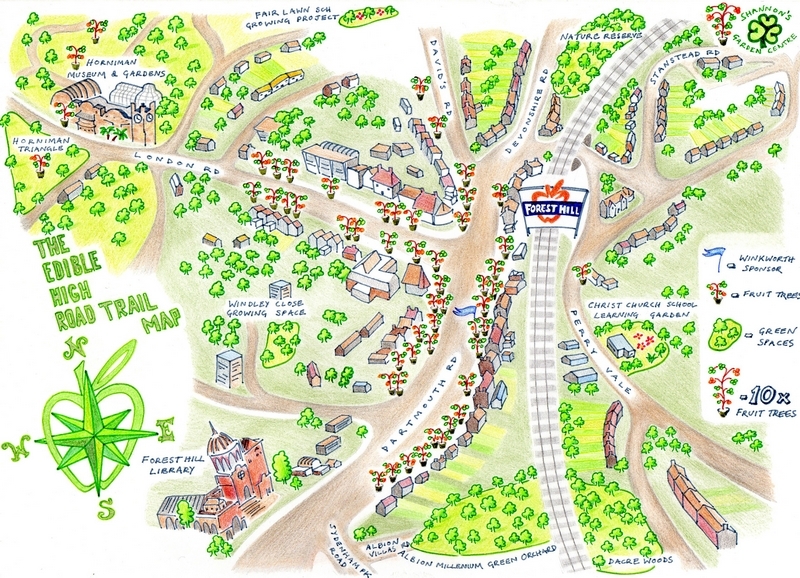 The trail map will be available from Forest Hill Library, the Horniman Museum and online at www.ForestHillSociety.com. That's the official press release ... but I'd just like to add that any fruit trees shop keepers don't want to keep will find a good home locally at Albion Millennium Green, where we will be extending our community orchard, started in 2010, and where I and others from the Friends of Albion Millennium Green will be conducting tours between 2.00 & 4.00 pm May 18th. Well done for posting about the Edible High Road, Tim. This should be a really fun afternoon in the centre of Forest Hill. It's not often we have a prize-winning tv celebrity to launch our events, so we are delighted to have Landscape Man Matthew Wilson to literally cut the red tape. We will also have give-aways of plants and seeds - even baskets of fruit supplied by J.Sainsbury's just to remind folk what the trees will produce. Kate's Sax Quartet will start the launch at 2.00pm with some fruit inspired music - well fruit always inspires music - and then, at 3.15 we will have a performance by Holy Trinity Primary School's brass band! How cute will that be?! Come along: indulge yourself in an urban orchard in SE London. And bump again. There may also be some performance art, with optional spector participation, from 7.50am outside Sylvan Posts, as Macbeth like, trees are seen to move. Forest Hill's Edible High Road launch yesterday went incredibly well. Over a hundred free runner bean and tomato plants were handed as well as large numbers of vegetable seeds packets and free fruit. Huge surprise from people that things were being given away free! Our tv gardening celeb, Matthew Wilson, cut the tape and posed for photographs (many thanks to Matthew and family for donating their Saturday afternoon to Forest Hill) and Shannon's Garden Centre has received unprecedented enquiries about fruit trees. The music was great! Many thanks to Kate's sax quartet and Holy Trinity Primary School's brass band. Our urban orchard could not have been created without many people volunteering many hours over the past few weeks - so thanks to all those whose efforts paid off yesterday and will continue to be seen over the next three weeks as Forest Hill's urban orchard continues to bloom. Forest Hill got a mention in the gardening section of the Observer magazine as being part of the Edible High Road Chelsea Fringe festival (along with Kilburn). It's great that FH is a part of it. Well done to those that made in happen. It's lovely to see fruit trees everywhere! I'd just like to add how impressed I was by the organisation of this, both from the Forest Hill Society and Anne-Marie of Lewisham Gardens. Although I started this thread, my involvement wasn't much more than that. With FH Soc regulars elsewhere committed, and other events the same day, it demonstrated strength in depth, and it was good to meet some new faces. I thought the trees were lovely - such a nice idea. Thanks to those who organised it.